Welcome to A Small List! 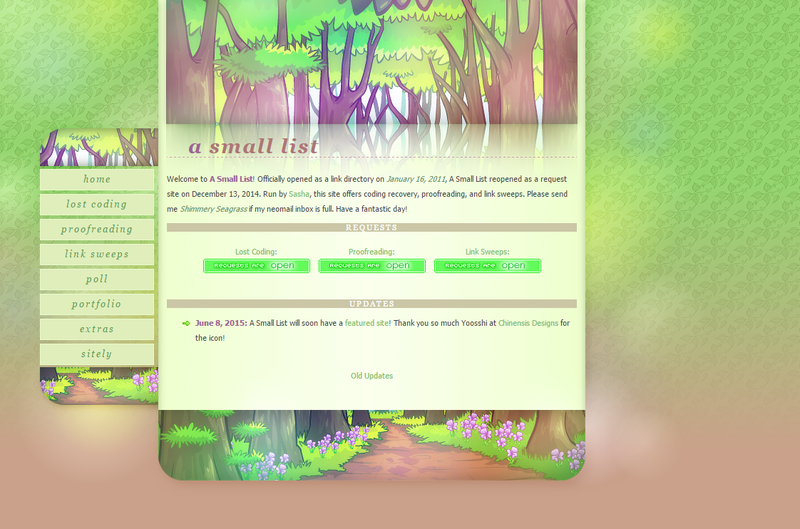 Officially opened as a link directory on January 16, 2011, A Small List reopened as a request site on December 13, 2014. Run by Sasha, this site offers coding recovery, proofreading, and link sweeps. Please send me Shimmery Seagrass if my neomail inbox is full. 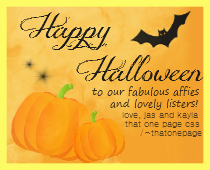 Have a fantastic day! August 23, 2017: Photobucket images aren't working anymore so I've reuploaded any. They should work now. At the rate of my life, I doubt I'll come back to ASL, so this page is mainly an archive now. Requests are currently closed and we are on indefinite hiatus, still. Date Requested Username Type of Request For What? Hello everyone! As you know, A Small List currently has a small list of requests that we can fulfill. I am looking to expand this list, but at this moment, I am not sure what may be useful to everyone. This is why I need the help of the site community to suggest what can be useful to an individual, their site, or the community overall. Whether it be new request types or new features, all suggestions will be taken! Submit something today, and who knows, it may be the next request we can offer! A request that includes both link sweeps and proofreading. None yet! Send one in? If you ever lose any custom code for any reason, we will do our best to recover it for you. It may not be up to the most recent update, but hopefully what can be recovered will help return your stuff to normal. it depends on when it was cleared. Note: It isn't required to fill out the entire form, but the more information, the higher the chance of recovery is. Don't stress yourself out filling out the form. Here, you can request anything to be proofread, from pet descriptions to site content. I will proofread to American English, but I will attempt British spellings if requested. Proofreadings will include Oxford commas (x, y, and z). As a previous link directory owner, I know that it is very important to have the most up-to-date links on your page for your visitors. Here, you can request to have your site checked for updated links. This is especially useful if you run a directory, regardless of topic. how many links there may be. Layout and coding by Seconds. PNG and bullet points by Details. Textarea coding by Cam from Someday in Ecstasy, edited by Aaron and Sasha. Open/Closed signs, neomail signs, and placeholders from The Lunch Box. Buttons linked to their creators. Idea for Code Recovery request belongs to Sasha. NEOPETS, characters, logos, names and all related indicia are trademarks of Neopets Inc., © 1999-2016. This section will change monthly. How A Small List came to be to what it is today. Old buttons, layouts, and more. May take a while to load. These date before A Small List exclusively offered requests. Sensation is a fabulous button request site owned by Sarah. Opening its doors originally in March 2011, Sarah is back after a long hiatus and continues to artfully create eye-catching and marvellous graphics. She also has a section where users can request their own personal layouts. For as long as I have run A Small List, Sensation has been a site that has stuck in my mind since it opened back in 2011, not just for its overall high quality but also for the fantastic person that runs it. Thank you Sarah for bringing Sensation back. The concept of A Small List began early in January, 2011. At first, this page was white with several linked buttons that I wanted to save for the future, as I have made mental notes of other links, but forgotten them over time. Soon, later that week, I decided to create another site with Unique Sites to learn more about coding and to actually try to run a site that I would update often, like others who have inspired me greatly. I finally thought of a name, got a premade layout, and began my journey of listing sites that other Neopians possibly have lost. 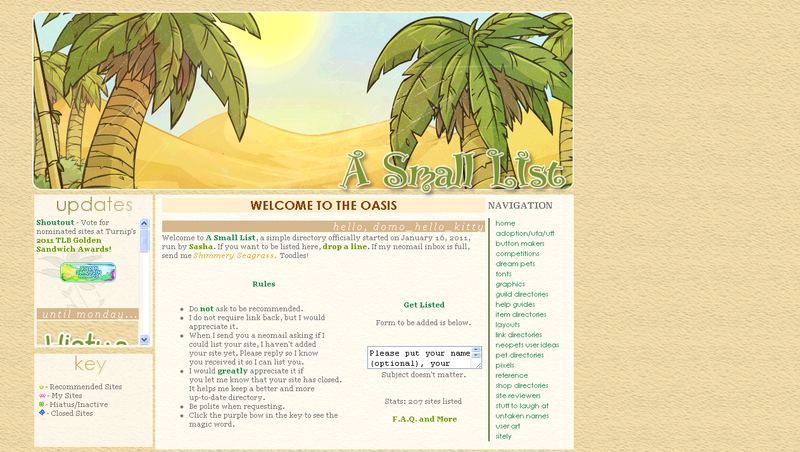 A Small List officially opened as a directory on January 16, 2011. After a series of unfortunate events, I was unable to update the page regularly. As my time is now limited, I decided to close A Small List as a directory and reopen it as a request site, now that I have a laptop. The first services offered are recovering lost coding, proofreading, and link sweeps. Code recovery requests started from helping a friend, and were soon offered as requests on September 2, 2011. I started offering all three of these services on December 13, 2014, when the site reopened. You may use these buttons. Drag and drop to address bar to see full size. I did not make any of these layouts. The update on the image is the last update I placed on that layout. Hover over image for differences of layout before it was posted here. To Sarah (0r30sr0ck) and Brian (subtileknives) : I know this sounds corny, but you two were the best sibling site team ever. I know that both of you have moved on from button making, but still, after I continued running my site, I still remembered your buttons. Sarah, I love the blue button you made; the simpleness, the pretty border. I still remember Sunset Towers, and Brian, I still remember how dark and mysterious Writhe was. The green button, after you changed it slightly from a bit gray to a vibrant emerald. You two were the best button makers in Neopia, and I wish you guys luck wherever you go on your sitemaking adventures. Best wishes! To the fabulous people at PPT Forums: I've only been there for a while, but I grew up there, talking to everyone. Siniri, Blue, Jacob, Plastic Ninja, ginny-ROX, and everyone else there, thank you. Thank you for everything. You all taught me so much, I could never write how much you guys mean to me. PPT is now forever my home, and I never want to leave it. I am who I am today because of your guys. Thank you. 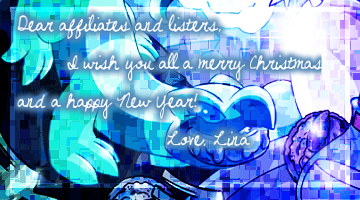 To my neofriends: I can never thank you guys enough for supporting me, chatting with me, and just being my friends. You inspire me to do greater things and... everything. Just everything. I look forward to chatting everyday with my neofriends and discussing anything and everything under the sun and moon and I just want to thank you for that. Old Request table - don't forget to change overflow in home div.